More than 850 miles of hiking trails crisscross the Great Smoky Mountains. With its miles of scenic paths and trails, the Great Smokies are made to be explored by foot. Whether you're a casual day hiker or a determined mountaineer, there's a trail for you. You can choose to stroll easy quarter-mile paths called Quiet Walkways or go on self-guided nature walks. If you're a more experienced hiker, you will want to tackle trails that bring you up steep mountainsides, along high ridge tops and through deep forests with rushing streams. Before heading off, be sure to stop at a visitor center to learn about your walking and hiking options, pick up maps, and find out about weather and trail conditions. The Appalachian Trail runs for 70 miles along the Park's top ridge. Pets are not allowed on any trails except for the Gatlinburg Trail and the Oconaluftee River Trail. Backcountry camping requires a permit. Many people choose to hike in the Park during the spring because of the abundance of wildflowers and cooler temperature. If you are planning a day hike there are a few things to keep in mind. Start early if you plan on covering some distance. During the summer months, the earlier you start the better because you can beat the heat, take your time and finish the hike before dark. Become familiar with the area before you hike. If you come across a trail intersect it is always nice to know which way to go. Choose a trail that is within you limits. It is better to underestimate your ability then taking on too much. You just might end up spending the night out in the woods unexpectedly. No matter what time of the year the weather in the Smokies is always changing. Get advanced weather forecast. Drink plenty of water during the hike and take alone some high energy snacks. Always stay on established trails! If you get lost . . STAY PUT and make noise. You will be easier to find if you are not moving around. Abrams Falls Trail (five miles round trip) is an easy, relatively flat trail leading to the 20-foot-high Abrams Falls which spills into a scenic pool. The trail begins at the Abrams Falls parking lot at the west end of Cades Cove Loop Road. Elevation gain is 340 feet. Hen Wallow Falls Trail (four miles round trip) is a moderate trail that makes a good, short day hike. The main trail leads to the top of the falls; a steep, narrow side trail leads to the bottom. The trailhead is before the picnic area on the road to Cosby Campground. Elevation gain is 520 feet. Indian Creek Falls Trail (two miles round trip) is a flat trail that offers an easy walk to picturesque Indian Creek Falls, which cascades 60 feet down a series of ledges into a wide pool. The trailhead is at the end of Deep Creek Road just past the Deep Creek Campground. Elevation gain is 100 feet. Laurel Falls Trail (two-and-a-half-miles round trip) is the most popular waterfall trail in the park. The paved trail is relatively flat and passes through a forest of pine and oak trees. The trailhead is located at the Laurel Falls parking area on Little River Road. Elevation gain is 200 feet. Historical Hikes for all history lovers, the Great Smoky Mountains National Park is an excellent place to visit and explore. With over 70 historical structures throughout the park, you can enjoy nature as you hike back to the past. There are several trails that take you back to some historic structures. This trail is accessible from the Maddron Bald Trail in the Cosby area of the park and from the Greenbrier Cove area. Is located on Newfound Gap road between Newfound Gap and Smokemout campground. Begins at the Ogle home site on the Cherokee Orchard Road in Gatlinburg. Starts behind the Sugarlands Visitor Center. starts off easy but becomes difficult. An initial one-and-a-half-mile trail takes you through Arch Rock's erosion-created tunnel. The next 0.8 mile is steeper and leads to Alum Cave Bluffs which is a 100-foot-high cliff. The last 3.2 miles lead to Mount LeConte, one of the park's best viewpoints. This last half of the trail is steep and, at times, hikers must grip trailside cables to traverse cliffs. is the easiest of the five trails to Mount LeConte's summit. However, many people still consider it strenuous. Take the Appalachian Trail from Newfound Gap to Boulevard Trail. Elevation gain is 1,545 feet. This is a somewhat strenuous trail, that winds through virgin forest to the Chimney Tops pinnacles. It starts at the Chimney Tops trailhead, located on Newfound Gap Road. Elevation gain is 1,335 feet. The first 4 miles of this 7.5 mile trek is a well-used path also know as the way to Charlies Bunion. A strenuous hike leading to the park's highest waterfall. It passes through an old-growth deciduous forest before reaching the 100-foot-high Ramsay Cascades. Do not attempt to climb to the top of the falls; several attempts have resulted in fatalities. From Greenbrier, follow signs to the Ramsay Cascades trailhead. Elevation gain is 2,375 feet. The Appalachian trail spans 2,074 miles from Katahdin in Maine to Springer Mountain in Norhtern Georgia, 70 of those miles are in the Smoky Mountain National Park. 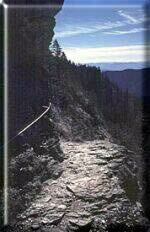 The trail reached it highest elevation at Clingmans Dome at 6,642 feet. The park has limited areas for safe biking because roads tend to be steep and narrow, and bicycles are prohibited on trails. Cades Cove and Cataloochee Valley, however, make for pleasant biking (bicyclists should exercise caution when approaching steep downhill grades). The 11-mile loop road around Cades Cove is closed to automobile traffic on Wednesday and Saturday until 10 a.m. (early May through mid-September). You can rent bicycles at the Cades Cove Campground store.